Image downloaded from www.soloistmovie.com and courtesy of Universal Studios and Dreamworks Pictures. It's hard to make a good film based on a true story without it being cloying or over-sentimental. So often, they end up being soupy, sappy messes (I'm looking at you, Patch Adams) that tend to induce the gag reflex rather than warm the heart. 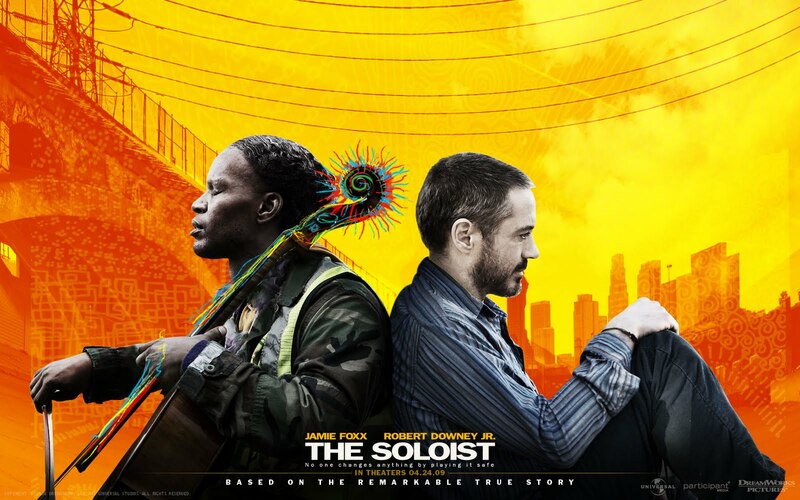 The Soloist, under the direction of Joe Wright, is one of those rare gems that stays true to real life while still remaining upbeat and - dare I say? - joyful. The story revolves around journalist Steve Lopez, a writer for the Los Angeles Times, and his chance encounter with a homeless musical virtuoso named Nathaniel Ayers. Lopez, played by the ever-versatile Robert Downey Jr., is immediately intrigued and wants to do a story on the kind-hearted, but mentally scattered Ayers (Jamie Foxx), but finds himself quite literally having to hunt down Ayers to try to interview him. Being a journalist myself, I appreciate and relate to the lengths we writers have to go through to capture a story that is really worthwhile (i.e. the woman from Juilliard abruptly hanging up on Lopez as he is trying to confirm Ayers's attendance there). His growing friendship with Ayers plunges him deep into the heart of being homeless in the city, but Ayers never asks Downey to pity him - he says this is a life he has chosen, for his own reasons, as well-placed flashbacks tell us. Downey is still wise-cracking and slick, but in a very different sort of way. The jet black slicked hair and well-groomed goatee of Tony Stark are replaced with a scruffy, graying beard and short, low-maintenance trim. He looks like the average, hard-working joe who's gotten successful based on his talent, and though his posh home in Los Angeles is impressive, he is still plagued by raccoons digging up his yard every night. Wright directs the film with a kind of deftness, like the well-tuned cello Ayers plays he knows how far to take the heartfelt encounters but still keep a pulse on what real life is like - without breaking the delicate strings of the storyline. Perhaps what I appreciated the most about The Soloist is that it does not have the traditional happy ending, or even an overly sad ending. The ending is just life. Wright has a confidence in the viewer's intelligence and doesn't feel the need to spoon-feed some sort of trite moral lesson. He delivers, and we take from it what we will. The only true weak point of the film was including Mary Weston (Catherine Keener)as the estranged ex-wife of Lopez who still works with him...not really the best idea, guys. Her emotion for him seems forced and frankly, even at the end, Downey acts like he could care less when she tries to be the good friend to him after Ayers's mental illness reaches a critical peak. But no matter. What counts is that the story between Lopez and Ayers rings true, and the message of knowing how far you can go to help someone before you have to let go is an important one and definitely not stated enough. Wright shows us the extent of homelessness in America but doesn't harp on the awfulness of it, which makes it all the more poignant. And when an older woman reads Lopez's article and is moved to donate Ayers her cello that she can no longer play due to arthritis, it shows the power of the press and the capacity for kindness in the human spirit. My editor at work always tells me as a writer when telling a story to "show, don't tell" to get maximum effect. This is exactly what The Soloist achieves. Be sure to watch the DVD special feature that interviews the real Mr.Lopez and Mr. Ayers. Hearing the story from their point of view is just one more bonus to this wonderful movie.